It was early evening on a grey bank holiday Monday when I arrived at Stonar Lake, Sandwich for 24hrs in pursuit of carp. The wind was blowing with some conviction towards the east bank and so I headed straight over there to locate a suitable, or least vacant, swim. The margins are almost always productive here. This is probably because the lake bed reaches extreme depths as it slopes towards the centre leaving the margins and a few isolated bars and plateaus as the only fishable water. With this in mind, my left and right rod were positioned accordingly in the shallows near the perimeter reeds. I put my middle rod on standby until I had located a gravel bar I had been told was about 90 yards directly ahead of the swim with my marker rod. Long casts [I still consider 90 yards to be a long cast!] are not my forte however and whilst I am frequently putting yards on to my cast each time I have the opportunity to practice, hurling the marker float against the oncoming wind was never going to work out well. What's more, above the surface of the water Stonar is pretty featureless and appears as an ongoing, sea-like expanse of water making it very hard to judge distance. I had the great idea of setting up marker sticks, wrapping and clipping up at 90 yards so I could tell if I was making that distance or not. This could well have been a good tactic had I not managed to get into a goofy tangle. At 8:30pm this tangle appeared salvageable. At 2:30am it was time to cut the braid and try to get some sleep. Sleep evaded me for some time and no sooner it seemed had I drifted off I was woken, as is the cliche, by the screaming tone of my left alarm at 4:30am. The result was one of Stonar's many small, yet hard fighting common carp weighing in at 10lb 8oz. 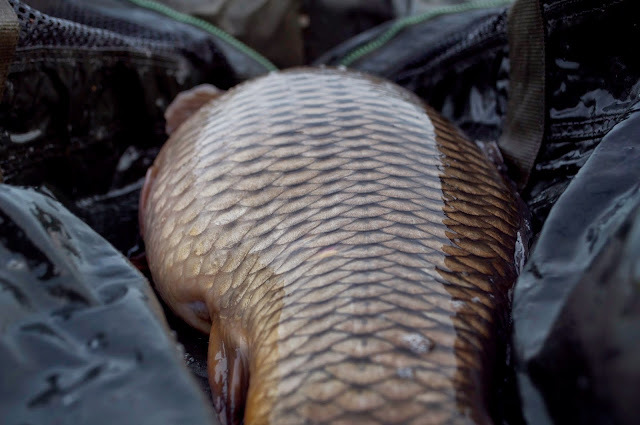 Once returned to the water, I began to settle back down only to be torn from sleep once more, again by an aggressive little common of 11lb 4oz. By now it was almost 6am, so I resolved to have breakfast, say good morning to my wife and then kip back down. 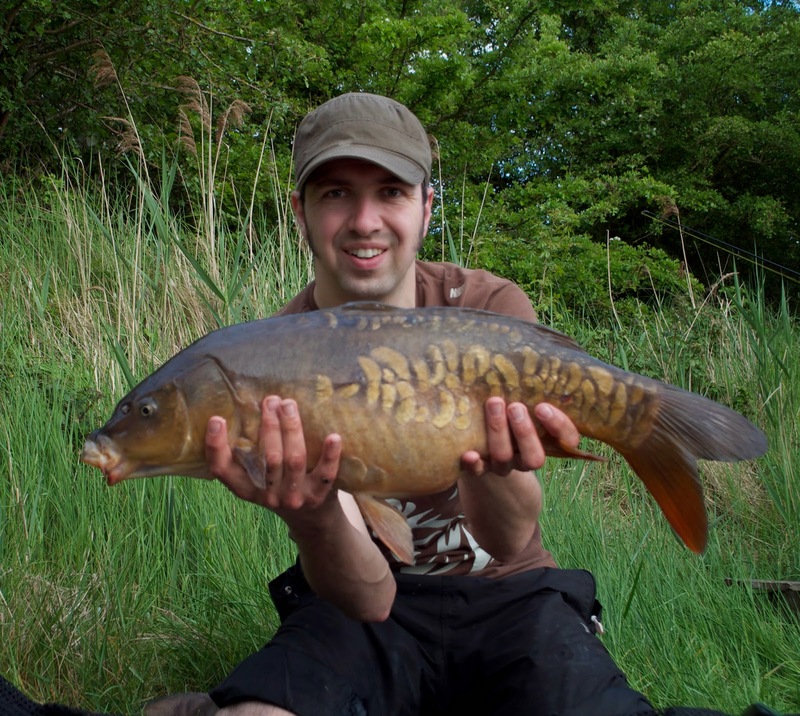 Whilst I was glad to have caught a couple of fish, I was seriously failing to cope with the lack of sleep! Breakfast was lovely, as was the phone call home but just as my head hit the pillow that blasted alarm went off again! This time however, the fight went on and on. The first two fish had been taken on popups in the margins but this fish took a snowman rig on the middle rod positioned another rods length away from the main baited area with a little pva stringer of chops - a decision I made after abandoning the idea of finding that gravel bar! Eventually, I caught sight of what appeared to be a good sized mirror before it careered down into the depths once more at a rate of knots. When, after many attempts to net this valiant warrior it was finally my captive, it turned the scales to a satisfying 21lb 6oz. This same rig also produced a 14lb common and 13lb mirror (both below), albeit with a long quiet afternoon watching the clouds go by before the latter was in the sling. All the pictures above were taken on my phone as, in spite of getting a lovely new Nikon DSLR, I could not get satisfying results on the self takes as I could with my old Sony bridge camera which I used to use for blogging purposes. The phone got the job done quickly and reliably which, when you have a fish on the mat, is exactly what is necessary. I hope, with a bit of practice, I can raise the standard of the photography I offer in these posts. You might have to put up with me posting a few of these cliched studies will I'm getting to grips with the new DSLR! As the evening drew in and home time approached, a bream kindly attached itself to my middle rod to let me know that there's no point staying, I'd had my lot. This trip could be viewed as a glass half empty or a glass half full. The best part of the night was spent untangling newly purchased braid only to bin it after much stress and sleep deprivation. The following day however, gave me a steady run of fish, all doubles and my first Stonar twenty! I know which memory I would prefer to hold on to.